On the Fluffdom Express post, Missy of a work in progress… asked me if I had any tips for laundering cloth diapers if you don't have your own washer and dryer. I've posted some info on that over at Hobo Mama, and in conjunction I'm posting this review here of the portable washing machine we bought for doing laundry when we rented and didn't have our own washer/dryer. After a lot of searching and review, I decided on the Danby Twin Tub portable washing machine with spinner, which you can find here on Amazon from outside shippers, or shipped from Target.com, where you can return it to any Target store if there's a problem. In all cases, the lowest you can get it for new at the moment is about $360 shipped. Also check out craigslist for your locale and freecycle, in case you can get lucky and pick up something used on the cheap. Just confirm from the seller that it works before you drag it home! I wanted a washing machine I could set up without any sort of plumbing installation, specialty wiring, or venting, since our apartment was set up for nothing of the sort. I also didn't want to get my landlady's permission, so I wanted something discreet. Since we had limited space, it had to be easy to hook up for use, then uninstall and maneuver out of the way between uses. The wash tub is on the left and the spinner on the right. 10 lb capacity wash tub — fits a lot of clothes! Second tub is a 1600 RPM centrifugal spinner that gently and thoroughly rids clothes of all excess water, allowing you to then hang them dry in less time or pop them in a conventional dryer for less time. Seattle can be — let's say "misty" — so getting all that extra moisture out was ideal. Just to make it clear, this is a spinner and not an air dryer; it's similar to the swimsuit spinners at the pool but bigger. The spinner includes an auto-shutoff safety attachment and a rubber lid for evenly pushing down small loads. Perfect for apartment dwellers and renters — NO plumbing, venting, or special electrical outlets required! Simply plug the electrical cord into the outlet, then hook the water hose up to your faucet with the provided attachment, and loop the wastewater hose right into the sink. You control all aspects of the wash: water level, water temperature, detergent amount, any special additives. You can wash a little or a lot, use hot or cold, soak for awhile or do extra rinses, wash for a short time or long; you have complete control! I had no problems operating it, but since it's mechanical and not electronic, any repairs are less of a headache. Compact and light-weight (relatively speaking! ): 29.5" wide, 18.5" deep, 33.5" tall; wash tub interior is 15"x16"x19". It's on wheels that go back and forth (unfortunately not side to side, however). I was able to move it around easily and even pick it up when necessary. You can read the reviews that convinced me to buy this model here to give you an idea if it's what you're looking for. My sister-in-law had a ventless washer/dryer combo and I thought we'd prefer that, but she hated it; clothes took hours and hours to dry, and it was a finicky machine. This washer takes a little more effort than a conventional washer/dryer, but it's so worth it not to have to horde quarters, then lug your heavy baskets down to the laundry room or out to the laundromat and wait around for someone else's loads to finish! Even before getting this, I usually hang dried my clothes, anyway, because it was gentler on the environment and my clothes. So I really have appreciated how well the spinner extracts the excess water, cutting the hang-drying time substantially. And the washer's washing ability is astonishing. Clothes get really clean, with no damaging wear and tear. Lanolizing a wool blanket for cosleeping in the gentle Danby washer. Here are the rest of my thoughts when I'm not trying to convince someone to buy it from me! It's cheaper than some other options (under $400 shipped vs. ~$1,000 for a new combo washer/dryer) but is made well — it's manual and mechanical as stated above, with the electric motor running only for the cycles and for pumping out the water, which avoids many wonky electronic glitches. It fits deceptively large loads in the washer despite being a petite size (smaller than a dishwasher but about the same height). I really loved the spinner (that's the second of the twin tubs) — it spins everything so fast (faster than a washer's spin cycle) that there's no water left to drip, so everything dries relatively fast on the drying rack. (It helps to point a fan at the rack, I discovered.) If I could have kept just the spinner for spinning dry handwashables, I would have. The washer, once I read the manual, was really straightforward to use. I really had fun figuring it out, actually! I don't like doing laundry in any case, but it was fun to have a new and unusual toy. The washer was very light, unlike a combo washer/dryer we bought from craigslist (that never worked) and that almost broke our backs moving in. The Danby is light enough for me to lift by myself, but it's on wheels so can be maneuvered back and forth. It's a green option, because you can reuse wash and rinse water and decide how much water and what heat of water to use. The machine itself uses less energy than a conventional washer/dryer. Since you're not drying your clothes, you're being very environmentally friendly by hang drying, as well as gentle on your clothes and cloth diapers. 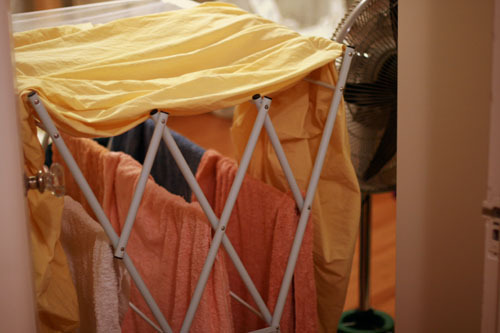 Just be sure to invest in some convenient foldable drying racks or retractable clotheslines, and try aiming an electric fan at the racks. Preparing our home birth towels and sheets, freshly laundered in the Danby Twin Tub! The biggest drawback for me was how much babysitting was required to wash laundry in this machine. It's not a set-it-and-forget-it type of situation at all. Because everything's manual, you control when the water comes in, what temperature you've turned the faucet to, and when to turn off the water. (There are guide marks on the side for the different load heights, although I just eyeballed it by how high the clothes were inside, making sure not to go over the highest mark.) You have to stick around after the wash cycle to flip the drain switch, then turn the faucet on again for the rinse. I usually did two rinses, because the washer did get so much dirt out that the first rinse was never clean enough to satisfy me. In other words, it's akin to hand washing, just larger loads and you don't have to do the scrubbing yourself. It demands the same amount of attention from you as the operator as handwashing does. If you're going to be around the house anyway and have time to pop back to it every once in awhile to flip the buttons and turn on and off the water, then it's not too onerous. But you can't put a load in and then go run errands and come back and it's done. (You can if you want the laundry to soak, though!) If you're used to a conventional washer/dryer and you want that experience, you will be disappointed in the amount of work this machine requires. If you're committed to forgoing the laundromat and know upfront about the quirks and concerns of this sort of setup, then you'll be satisfied with the quality of performance you get, especially for the price. I didn't have any problems with leaks from the machine itself, but any time you have a machine that takes a bunch of water and hoses and faucet hookups, there's going to be water spillage somewhere or other. You'll want to use this machine in a kitchen or bathroom or basement or somewhere else that can handle occasional drips and splashes. For instance, the drain hose had a sink clamp on it that for me didn't fit the shape of our sink. That meant I had to weigh it down with a heavy box every time I did laundry, and still sometimes it would slip and spray the wash water everywhere. I also had a problem with getting the connection to our faucet really tight, but we were in a very old apartment at the time, so maybe that was the issue. I had to wrap the faucet connection with a washcloth to make sure any leaks went down the drain instead of up in the air. Because the washer hooks onto an existing faucet and drains into a sink, if it's your kitchen or bathroom, you'll have to remove it when you want to use the sink again. 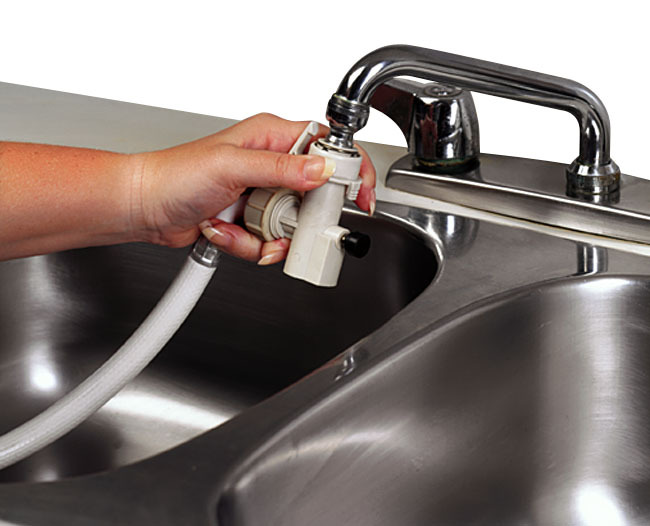 If you have a separate utility sink and can leave it hooked up, that's ideal, but otherwise, your faucet will be unusable while the machine's attached, and you'll have to unhook it afterwards. It's designed for that, however, and the hoses and cord store neatly on the back and side, so it's not that big a deal. We actually had three different things we hooked up to our kitchen faucet: the portable washing machine, the portable dishwasher, and the hose to water my garden out the window, so I was used to switching out various attachments! The spinner doesn't take as large a load as the washer, so you have to separate your wash load into portions to spin. That's not really a con, but it's not a pro, either, so I included it here just as a note. Line drying has its advantages and disadvantages. See my tips above, and know that it can get a little annoying to have clothes and diapers hanging everywhere while they dry. I used vinegar as a rinse aid and fabric softener, because otherwise you can't use any conventional fabric softeners. With line drying, that means that some items dry pretty stiff. Cutting down on the amount of detergent helps, but there's a notable difference. I also found that not as much lint comes off as in a conventional dryer, which can be an issue if you're around a lot of pets or in other linty situations. To solve both problems, you might consider adding a portable dryer that vents out a window to your wishlist. Arrange a bartering system with friends or family for the use of their washer/dryer. Hire a diaper service and a laundry service. Ah, luxury! A different portable washing machine, such as the Haier HLP23E Electronic Pulsator Top-Loading Portable Washing Machine, which I did not see when we were last in the market. It looks like it might be a bit more automated than the Danby so is worth a gander. Buy a combination ventless washer/dryer — this was the other type of washer I looked at seriously. I liked that it did both the washing and drying in one machine and didn't require special electrical, plumbing, or venting hookups. 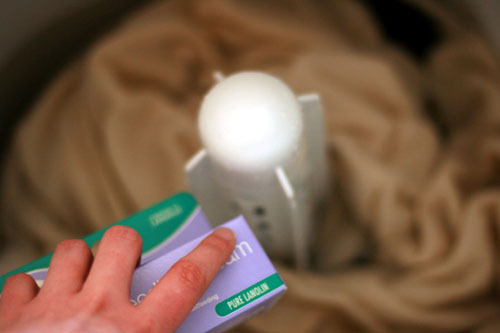 The cost was much higher, though we found one on craigslist — that never worked. We had to pay junk haulers to take it away. After that, I went with the Danby instead. As I said, my sister-in-law had a combo washer/dryer in her apartment and hated it, because of how long it took to dry anything and how clothes still came out damp and wrinkled. I think, however, it's all a matter of perspective there, too. If you go in knowing the issues that combo washer/dryers have, you can be satisfied with one and learns its tricks and limitations. For us, especially with the old, rickety floors in our 1920s apartment, going with a lighter and more reliable machine was very important. Note that the higher cost of the combo washer/dryer has to include any potential future electronic repairs, too, while a mechanical machine like the Danby would likely cost less to repair (assuming the warranty is not in force for either). 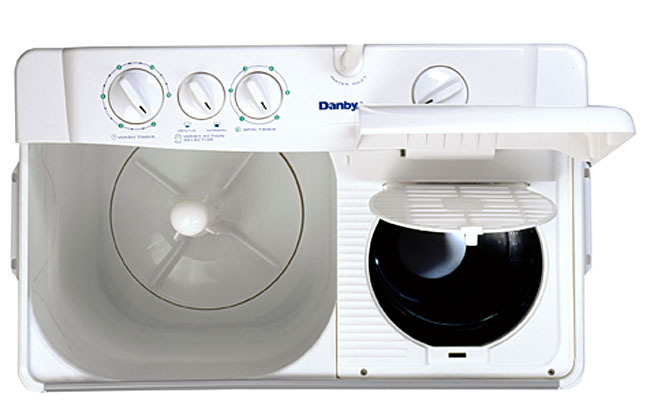 The nicest thing about a combo washer/dryer is you can put in a load and let it go through the whole cycle by itself while you're at work or sleeping or running errands or whatever, whereas with the Danby, you really do need to stick around to finish the load. The other plus is the drying ability of the combo models (such as it is). Read reviews before deciding. They seem to be split between those who love the machines and those who hate them, whereas the Danby had overall more consistent positives from those who were educated about what to expect. Handwashing/bathtub washing everything. It's a thought! A portable tumble dryer — this would be in addition to the Danby, rather than instead of. Once the clothes have been spun, you could pop them in a portable dryer like the Haier HLP140E Compact Tumble Dryer that vents out the window, so you don't have to hang dry. The spinner would greatly reduce drying time, so that could be an ideal combination of machines to have. 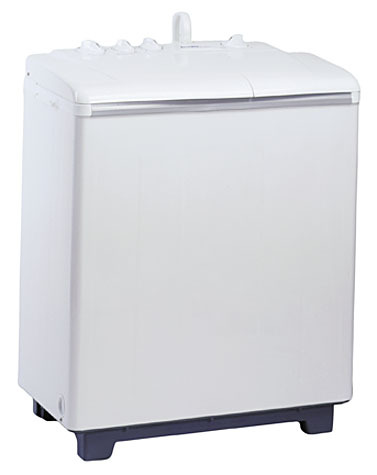 A smaller portable washer for small loads, such as the Haier HLP21N Pulsator 1 Cubic Foot Portable Washer, or a really small countertop washer for really small loads, such as the Wonder Washer (not as great for cloth diapers, if that's your angle). For more information on laundering cloth diapers or other laundry in an apartment, head over to HoboMama.com. Let us know if you've had any experience with unconventional washing machines and what you'd recommend! with my own moolah several years ago. companies or products mentioned here. Professional photos are courtesy Danby.com. See my full disclosure policy here. Thor washer dryer - http://www.thorappliances.com - offers a ventless combo washer and dryer in one. 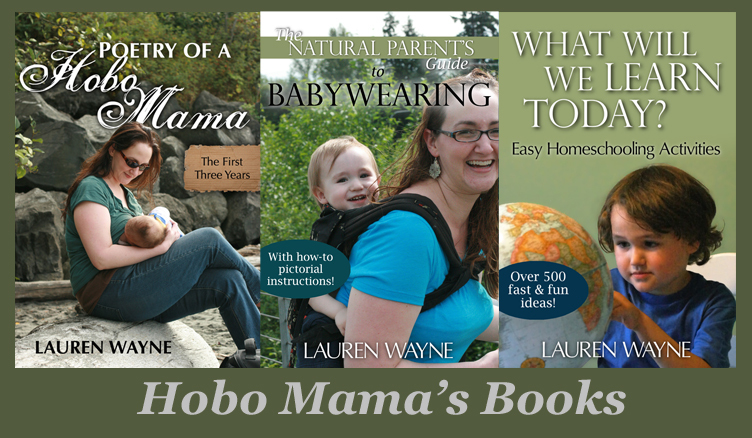 welcome to hobo mama reviews! Click here to contact me about giveaways and reviews. Free shipping at Signing Time! Last day to win a WondaWedge! WINNER: Amy Adele + Labor Day sale ends today! Suffer from head aches? Maybe the headache hat can help? Why Florida Prepaid – Your Questions Answered! Reusable Felt + Fabric DIY Easter Basket Grass Alternative #ILikeSchleich + A Fun Contest! It’s Okay to Ask: Take Cholesterol to Heart! 1/2 Price Shakes & Ice Cream Slushes Only at Sonic Drive Today Only (July 26, 2017)! Mommy Living the Life of Riley! The Adventures of Paul & Natalie..
BIG NEWS! Best Toys for Toddlers has MOVED! My Need for Speed Movie Review! Have you joined SavingStar yet? And the Trop50 Giveaway Winner is.... Ellen Bryers!! Hellmann's? Where Did It Go? The crazy life of Stuffy Nickel. Copyright © 2011 Lauren Wayne aka Hobo Mama. Template adapted from Deluxe Templates via All Blog Tools. Header photograph copyright Daniel Jaeger Vendruscolo at stock.xchng. All other design and photography copyright Hobo Mama and Crackerdog Sam unless otherwise specified. Writing copyright Hobo Mama. Use it without permission and you might endure a horrifying boxcar accident. Just saying.